The Mac OS platform has been one of OdiTek Solutions' unique strengths. Mac OS or Classic Mac OS is a series Graphical User Interface based Operating System developed by Apple Inc. Apple Inc. released 9 Classic Mac OS distributions from 1984 to year 1999. These distributions were credited for bringing GUI based operating system to the general public were as previous distributions, like MS-DOS, used Command Line Interface (CLI). At OdiTek Solutions, we have provided Mac OS Development Services since Day 1; we have developed for all Apple OS versions (workstations or servers) and development tools since Mac OS 8.6, including the latest i.e., Snow Leopard. We have expertise on a wide range of technologies and industry-standard tools. We cover almost everything from System-level to User-Interface Applications. Mac OS distributions are always appreciated for their ease of use. Ever since the first version, Apple Inc. concentrated on GUI based navigation so that layman users can use the product without learning crazy, technical commands. This attractive GUI sits on top of a Unix core which is best known for its stability and security features. Mac distributions run on hardwares produced by Apple Inc itself, therefore there is a perfect synchronism between the functioning of hardware and software which is a plus point. Apple controls the production from start to finish and all distributions are designed, optimized and tested to work together. We have developers with plenty of experience in developing applications for different Mac OS/OS X distributions. They have already built many eye catching Cocoa based applications which are very well received by the public. We are ready to develop your dream OS X application and upload it to the Mac App Store and get it approved. Objective-C accommodates a simple architecture that helps us in creating interactive user interfaces. Our skilled designers makes the best interactive UI for the best user experience. The dynamic nature of this language gives a power and unusual flexibility in the language which reflects in our works too. Our designers and developers are already researching on the possibilities of creating innovative apps and waiting for the release of watchKit. We have started studying the various aspects of the watchkit and the possibilities with its numerous features. Apple has announced release of WatchKit in early 2015. We at OdiTek are getting ready for it. The WatchKit collection of development tools and APIs intend to make Apple Watch device a new platform for developers. Developers can start building fully functional native apps specifically designed for Apple watch. Our game development experts in India are really good with rotating, mirroring, parallaxing, scaling, tinting, sliding, masking to get the best out of the game engine. Our team spends their quality time to get the perfect animation and effects that suits the app and make sure it doesn’t distract the user. OdiTek is one the leading iphone app development,iPad app development and Mac development company in India. We have created numerous iphone apps for our clients and got them reviewed and approved by Apple's App review board thereby getting them listed in the app store. Apple has introduced a new payment method for its users – Apple pay is a secure and easy way to buy physical goods and services. This is available in iPhone 6, iPhone 6 Plus and Apple watch devices. Users can save their credit/debit card details in their devices. These details are stored in a Secure Element embedded in the new models, which have no contact with the main processor where the app runs. Developers at OdiTek are experienced in doing complex data management using Core Data which helps faster development of applications, guaranteeing compatibility with future releases of the operating systems. As data is described in terms of entities and relationship,code can retrieve data at object level which makes the process faster. Open GL is a set of cross platform API calls for rendering 2D and 3D graphics. If you have a software in mind that requires interaction with a lot of 3D models or if you are thinking of a mobile application and looking for a suitable iOS or Android developers, we have the solutions for you. TestFlight Integration Services Our experts know about each and every aspect of Testflight and can set up your app and all you need in the Testflight in few moments. We are very well versed with Testflight and its services. Our developers are keen to fix the bugs reported and push a new version in the next moment. We have a panel of developers who keep track of the bugs reported and comments and make sure its all fixed in the very next build. Android 5.0 Lollipop Mobile Development Services Android Lollipop which is Android 5.0 has come into the market with amazing new features , we at Quintet can help you develop your app on this new OS platform version by Android. OdiTek Solutions' early development work on Mac OS started from 8.6 and 9.0 (released in Oct 1999). Though Mac OS 9 was launched as the best internet OS ever, it lacked modern OS functionality, such as protected memory and a real/complete pre-emptive multitasking environment/capability. These made programming more challenging, since OdiTek Solutions' core team got deeply involved in complex client-server, multi-tier, multithreaded application development (products) for its select clients – being one of the few companies doing Classic Mac/Mac OS 9 development in India. 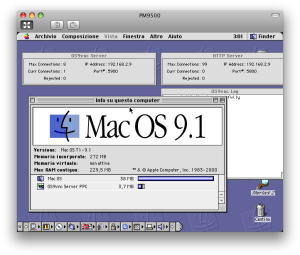 We have done many projects on Mac OS 9/Classic.